You may not realize it, but the way that Jesus called His first disciples is similar to how we recruit for our businesses. Jesus established credibility. In verse 3 He sat down and taught people from the boat. He added value to their lives. Jesus gave them a vision of something bigger than themselves and communicated in terms that they could understand. He didn’t talk about evangelism or spiritually impacting the Roman Empire. He used words that the fishermen would understand. He promised to equip them for the vision. 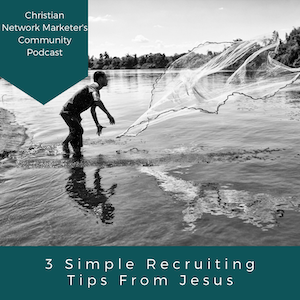 Jesus calling fishermen to fish for men instead of fish, is not much different than the way you all in your network marketing businesses recruit to build your teams. We teach, we invite in simple terms, and we promise to equip them and to actually equip them. Those are my tips for today, and I am curious to hear what you think of that and if it helps you. If you need help crafting those tips to incorporate into your business, reach out to me through our Facebook group, or Facebook page. Thanks for reading today’s post! Join our Facebook group to continue the conversation and share with us how God is working in your business.